I first ran across Mai's mice during a visit to Paxton Gate in the Mission last summer. It's one of my favorite places in the city, full of skeletons and vintage medical supplies, venus fly-traps and in the display window a huge taxidermic "Unicorn." The curiosity shop pulled me in that day, and I came across something new — tiny mice dressed up in ridiculously detailed costumes. The most perfectly fascinating craft, I just had to contact the woman who was making them. A veteran of the video game industry, Mai had just recently started selling her creations under the studio title Le Heart Design when I contacted her. 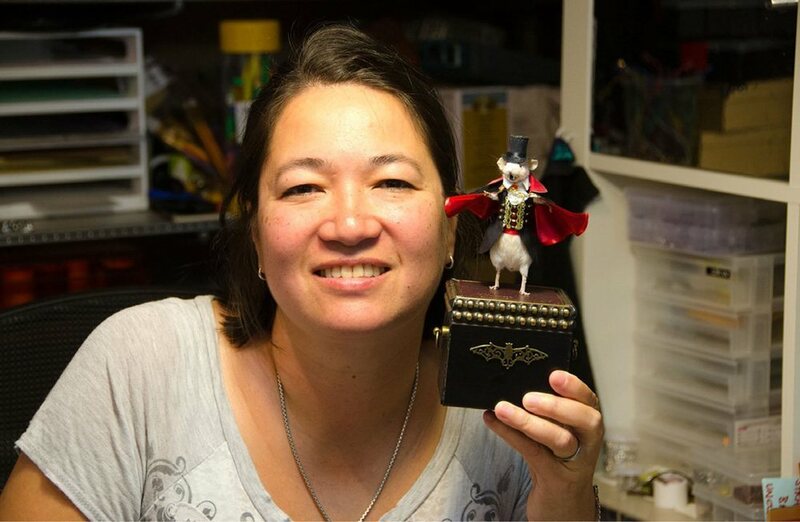 Pulling from her long history of game development, she crafts each character meticulously. It can take up to a week to create just one. 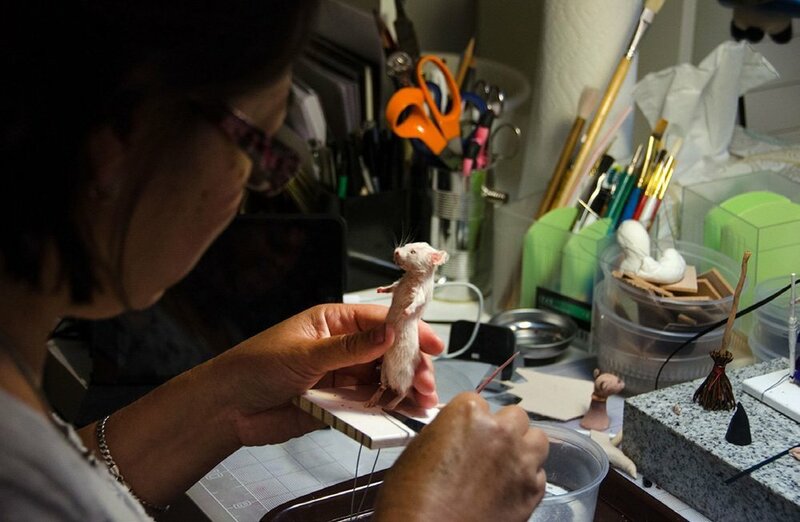 She invited me to her studio in her house in San Rafael to show me a bit more about her process, and how she got into the craft of creating these little beauties. Let’s get started with little bit of background information. I was born and raised in France. After art school I worked for a year in Paris, then I applied at LucasArts up here. I was there for ten years, and then I went to another and then another gaming company. I got tired of it. I finally discovered leatherwork when my father-in-law gave me all of his tools for leather, last summer. I started doing bracelets and belts and all that, I loved it. It was nice to work with my hands after working on a computer for 20 years. And not having anything to show for it, because consoles and platforms evolve so fast that you can’t even use any of the stuff that you did. It’s all gone. and never did anything with it. But in learning leather, I realized I could shape leather. I said “Ooh I could make tiny little armors. Roman armors or fantasy armors." I did a little Roman guy first. I had the idea of making a chess set, so that was my first taxidermy thing. Then on Ebay I came across a lot of leather that was really thin. Bone white with little holes in it — it’s even too thin for lining purses, it’s really just crafts. I ordered it, a whole goat hide, and I realized it’s thin enough to make clothes instead of armor. I love working with leather because it’s very very forgiving, it doesn’t fray like fabric. You can glue it, you can sew it, you can do anything with it. I did that little Steampunk guy, and I was so proud of him at the time. Like “Oh my God it’s cool!” Now I look at him and say “Oh my God he’s horrible,” hahaha. But after that I actually did another one, Obediah, and I was really happy with him. did you grow up in nature or something like that, to get a connection with taxidermy? I always liked bugs. My sister and I would hunt lizards, collect snails and all that. I remember, I don’t know if it has anything to do with this, but I must have been 13 or 14. I would go into the woods with my friend Freddie, into the pine forest. One day there was a carcass of a dead bunny. There were flies all over it, but the fur was still there, and most of the meat. It was stinky, but I thought, “Oh my God, I want to do something with the fur” I picked up two branches and I lifted up the thing and we walked a mile back to the house. I dropped it in the backyard and my mom was like, “Oh my God, what are you taking home?” but I never did anything with it. It ended up in the trash. There wasn’t the internet at the time, to just look at a video on Youtube to look how to tan or treat a hide. But I never did anything else until four years ago finally, with the class. Can you tell me about the process for the taxidermy? I buy frozen feeder mice from the internet. I have whole drawer in the freezer. I don’t kill them — I couldn’t. I thaw them, and peel off the coat, like a coat. It’s clean because you don’t want any nicks or bleeding. I cut on the back, you won’t see the seam through clothes. I go in with a little Exacto knife. Do the incision in the back and peel the fur off, little by little, cutting the bone at the legs with little snippers. I make the body out of Model Magic. The head I make out of Super Sculpey, it’s soft until you put it in the toaster oven. Because I started making them so much, I actually made myself a little mold, so I can press the Super Sculpey in there. That's at least a start, so it goes faster. I put the eyes in, little beans inside the skull. And I stuff the body, pull the wires and armature through the limbs, and sew it back up. ARE THERE ANY SORT OF PRESERVATIVES? I use Borax, even though my teacher said Borax is really for birds and fish. With mammals, the skin is a little thicker, fatter. But for the mice, it’s been working fine. HOW DID YOU DECIDE YOU WANTED TO START SELLING THEM? The goal was to do something so I could earn some money, at least pay my share. It needed to be commercially viable. I just kept evolving little by little, then I showed these guys to Paxton Gate. Everybody was really excited, and they see that kind of stuff every day, so I thought I might have something. I sell them for a lot of money, I realize. But at the same time, it takes me a long time to make them. I have so many years of experience doing character design, posing them. I have high quality standards. I wouldn’t do anything below it. I don’t want to sell them for a bargain, it just makes me feel icky, because it’s not worth it for me then. I put a lot of work into it, it’s not just a job I can send to China. It’s my stuff. People ask me, “Where did you buy the costumes, did you find them on Etsy?” It’s like “No! I’m making them!” If I want to make a little compass, I actually have to figure out how am I going to do it, do the glass and everything. I do a couple of prototypes, it all takes time and effort to do that, you see it in the final product. I know, that’s what people always tell me. They always think they’re bigger than they are, they think it’s rats. It’s a lot tinier than you think and it’s very intricate. I spend half my day just looking for stuff on the ground that I have dropped. It sounds like some of the inspiration comes from your background in gaming? Are there other sources? I feel like very early on I decided to stay very classic. Do the Victorian stuff and the Steampunk. I realize I have a very narrow idea of what my range is. I don’t really want to do pop culture. Well, maybe I will down the line, because I realize it would be more popular, probably. But at the same time I want them to be cute. I don’t want to remind people that they’re dead. My son wants me to do a Terminator one, but I said no, because then I would have to dig up his face and do blood. It’s very narrow what in my head I want to do. All of the costumes need to be iconic. It’s a mouse and I don’t do pants. They need to be immediately readable as what they are. A lot of people do two-headed mice, all of that creepy stuff. Even within the Steampunk, with gears inside the body and all that. I don’t want to do that. I’d like to believe they look better in death than they did when they were alive. WHAT ARE YOU PICTURING MOVING FORWARD? I have ideas about a few design ideas that I’d like to do before I get tired of it. I know that I will get tired of it eventually, because I’m that way. I just get bored and need to move on. The mice so far offer so many possibilities that I’m still having fun. 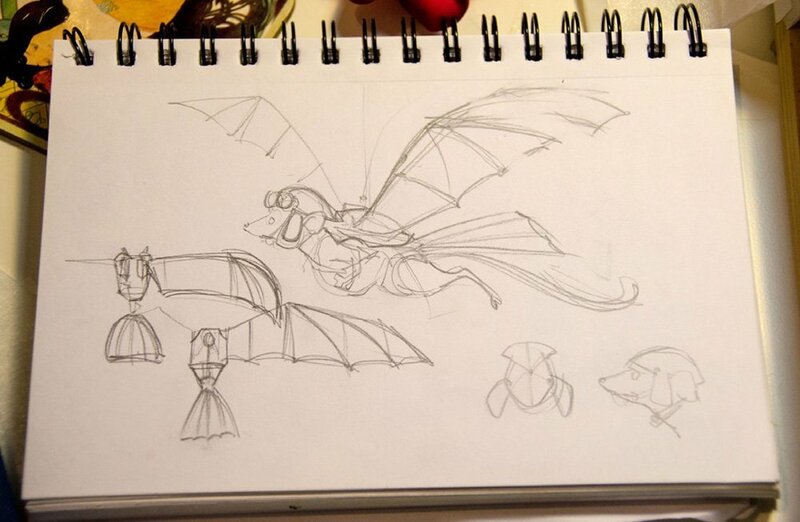 I actually wanted to do a Leonardo DiVinci Flying Machines. It started with a full-on dirigible, with a little mouse at the wheel. But then you go, “Ok, what can I realistically do?” I ended up with just a little harness thing with a mouse. Then I could hang them on a wire, on a pedestal. I do that, or, if I do movies, classics. Like I do want to do Tippi Hendren in the Birds, I’m starting to collect Bumble Bees for the birds. It needs to be very iconic. Or Mommy dearest with the wire hanger, or What Ever Happened to Baby Jane with the wheelchair. Yes! I took a squirrel class in April or May, thinking maybe I want to do squirrels. But the thing is, they’re much bigger, it would be a completely different process and I’m just not ready to do that. Because then the jewelry findings would be too small, then it’s real leather work. I can’t imagine it would be as flexible as mice. Exactly, as soon as it’s big it can’t be cute anymore. I might end up doing a cowboy costume for him, with a vest and some holsters. But that’s all I can think of, to do. Unless I do little mice riding a squirrel.